A NEW food court has been opened in East Riffa’s Oasis Mall by Al Rashid Group offering shoppers a comprehensive choice of cuisines. The 18,620sq/m food court features four outlets featuring dishes from all around the world. The Peking Hut specialises in Chinese dishes, O’Burger serves a large range of burgers and kids specials, Tandoor Express offers a mouthwatering selection of Indian specialties and Pasta Plaza is dedicated to connoisseurs of Italian fare. 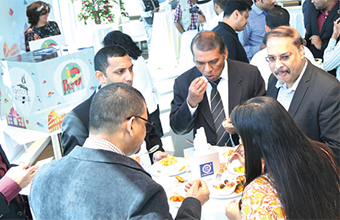 Al Rashid Group staged a food tasting launch event last week followed by a raffle draw after inviting guests to pick their favourite outlet to get a chance to win a flight ticket to New York, Beijing, New Delhi or Rome to explore the local cuisine even more!